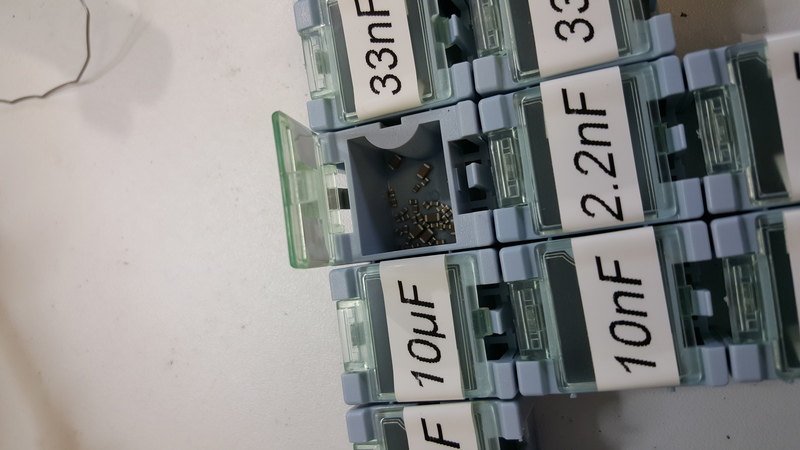 Storing SMD resistors and capacitors will always be a problem until we eventually integrate all passives in ICs or the PCB itself. Until now, I have been storing the little crumbs in the Digi-key and Mouser bags they come in, I would use what I needed on the PCB and put the rest back in and tape it closed. The hundreds of bags I have accumulated over the years have ended up in cardboard boxes laying variously around the office. When I need a part and don’t have time to wait for shipping (which is why I bother saving these little 1/10 cent things) I have to spend 10+ minutes searching through the boxes. I decided a week ago I really needed to change my “system” and set up a proper storage arrangement. I was very excited to come across these little boxes on Adafruit. I immediately ordered 4 10-packs ($3.95 each!) and this wonderful label maker from Amazon for $19. Five annoying hours later, I had compressed 90% of my parts into a few common values. I even had enough to throw some ICs and LEDs I use into them. I am very satisfied of the quality of these boxes, I have dropped a few with 0402 parts and none fell out. The boxes have a spring-loaded lid and snap together very easily. My end goal is to never have to order a fairly common passive component ever again (and reduce the complexity of setting up a BOM for a low-volume run).